Iridium's smallest, lightest and most advanced voice and data module ever, the Iridium Core 9523 is pushing the boundaries of global communications. It features simplified integration and delivers powerful capabilities, creating opportunities for new partner products and new markets around the world. Iridium Core 9523 is Iridium's smallest, lightest and most advanced voice and data satellite transceiver module ever, enabling simplified global voice and data connectivity through the world's furthest reaching network. Over 90% more compact than our previous model and featuring standardized connectors, it easily integrates into new partner products to reach previously under-served consumer and vertical markets - and drive global communications in ways never thought possible. From single or multi channel communication platforms for maritime, aviation and land mobile markets to highly capable, feature-enhanced handheld smart devices and unattended sensors, the Iridium Core 9523 module delivers cost effective satellite voice and data communications. Iridium Core 9523 supports all Iridium voice and data services. It delivers the capability needed to develop innovative communications devices, and the technology backbone for applications such as GPS and location-based services, Wi-Fi and Bluetooth. Iridium Core 9523 features standardized connectors, simplified PCB integration and ultra compact form factor. Partners can easily mount Iridium Core 9523 directly onto their application board - enabling optimization through shared components and power sources. Smaller than a credit card, this compact module is also "at the heart" of the new Iridium Extreme™, the most rugged satellite phone in the market. With the Iridium Core 9523, FLYHT is able to provide aircraft crew with reliable voice and data services through Iridium's global satellite network. The AFIRS 228S enables real-time data connectivity, both on the ground and in the air. 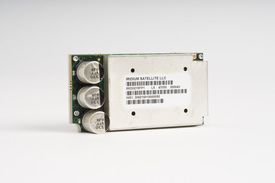 The 9523 is an Iridium transceiver module designed to support all Iridium’s voice and data services (dial-up, direct Internet, RUDICS, SBD and SMS). The 9523 is a core transceiver where hardware such as SIM card reader, keypad, display, power conditioning, etc., must be provided by application developers.